Citation: C N Trueman "Music in Nazi Germany"
Music, along with all other forms of culture, was subject to Nazification fromJanuary 1933 on. The policy of ‘Gleichschaltung’ (coordination) meant that music had to conform to the Nazi ideal. Hence some composers were tolerated and even elevated to a status of pure Nazism, while other composers, frequently Jewish, were shunned and effectively censored. Hitler, along with art, films and architecture, played a major part in what was musically tolerated and what was not. German composers had played a huge part in defining classical music during the Eighteenth and Nineteenth Centuries. Beethoven, Mendelssohn, Schumann, Richard Wagner and Johannes Brahms all left their own individual mark on music and culture in general. In the Twentieth Century, the Austrian composer Schoenberg had also become very influential in Berlin, the city he worked in. The influence of these composers, and others in Germany was undeniable but their collective genius counted for nothing in Nazi Germany if they failed to impress Hitler. The Fűhrer had an almost fanatical devotion to the work of Richard Wagner, which to Hitler represented everything that was good about culture in Nazi Germany. To Hitler, Wagner’s music personified Nazism. His attendance at the Bayreuth Festival was very well publicised by the Ministry for Public Enlightenment and Propaganda. In fact, Hitler ordered that the Bayreuth Festival should become a National Socialist annual event and performances continued up to 1944. The messageGoebbels wanted to spread was a simple one – if the music of Richard Wagner was good enough for the Fűhrer, everyone else in Nazi Germany should follow his lead and listen to good German/Nazi music. Therefore there was enormous promotion of Wagner’s music by German radio stations and major concert venues frequently played his music. Other composers were not as favourably received and even listening to their music could have been deemed anti-Nazi and subversive with potentially dire consequences. Music by Mendelssohn and Meyerbeer was banned because they were Jewish. Schoenberg’s music was banned because it was too radical and in the mind of Hitler simply not classically German. The same was true for the compositions of Paul Hindemith. He was an internationally recognised composer but in Nazi Germany his music was seen as being too experimental and decadent. Hitler banned his music from being played in concert halls while Goebbels stated that Hindemith was an “atonal noisemaker”. ‘Gleichschaltung’ not only covered composers. Orchestras were purged of Jews as were the casts of operas. For Hitler only true Aryans could truly play the music of Wagner. Famous Jewish conductors went into exile to continue their work; one of the most famous being Otto Klemperer who had international fame for his interpretation of Gustav Mahler. 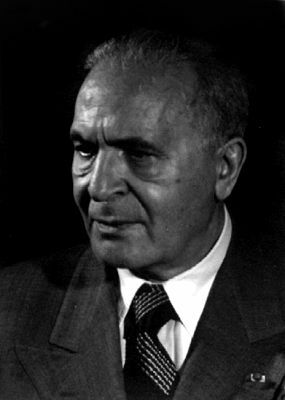 Equally famous for his interpretation of Mahler was Bruno Walter (in photo) who was also a Jew. He had been criticised by Hitler pre-1933 and had to flee Germany once Hitler gained power. Walter went to Austria which was his primary base. Walter was working in Paris when the 1938 Anschluss took place and unable to return to either Germany or Austria, he settled in France which gave him citizenship. Ironically, by fleeing Nazi Germany pre-1939, they may well have saved their lives. Despite the ‘Nazification’ of music, some did stay in Hitler’s Germany. The most famous was the conductor Wilhelm Furtwängler. He had fallen out of favour with the Nazi establishment because of his defence of Paul Hindemith. However, he made his peace with the regime and remained in his posts at the Berlin Philharmonic and the Berlin State Opera. Richard Strauss was put in charge of the Reich Music Chamber for some time while the world famous pianist, Walter Gieseking, was sent abroad by Goebbels to display his talent. Concerts at halls such as the Berlin Opera House became major party events. Senior Nazi functionaries were all but required to attend and there was a very good chance that the music on offer was composed by Richard Wagner. What might be defined as popular music was also heavily controlled by the state. Jazz music was banned as it was considered to be ‘black music’ with origins from the southern states of America. The Nazis associated jazz music with Black Americans and as a result it was labelled ‘degenerate’. Goebbels also tried to ban ‘Lili Marlene’ but had to backtrack when German soldiers throughout Europe requested that it was played on Reich-controlled radio stations.